Aluminum awnings are a great addition to any home. May is a great time of the year to install residential aluminum awnings. The sun’s rays haven’t gotten too intense yet, but people are still looking to spend more time outdoors. From cookouts to parties, the summer offers us a lot of opportunities to enjoy the outdoors. Of course, Mother Nature doesn’t always play nice, and we have to deal with blazing heat and strong winds from time to time. If you’re looking for a little protection, aluminum awnings are a great investment for residential projects. There are a lot of awning options when it comes to color and style, so it can be difficult to narrow down the best residential awning for your home. Many homeowners find that aluminum awnings are the perfect solution because they are lightweight while still being well constructed and sturdy. 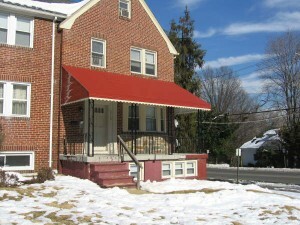 Homeowners look for an awning that is versatile, as they can serve so many different purposes. When it comes to benefits, aluminum awnings have many. Any time you add an addition to your home, you want to have the piece of mind that it can stand up to the elements. While the elements can take a bit of a toll on some types of awnings, aluminum awnings are designed to be weather proof. They can withstand pressure from wind, sun, and heavy rain. Aluminum awnings have a longer life span than most other types of awnings. Instead of having to replace your awning in just over a decade, your aluminum awning will last roughly 40 years. Aluminum awnings are also built to resist warping, bowing and stretching. The low maintenance of aluminum appeals to many savvy homeowners. Instead of cleaning or even trying to repair your awning after damage from a storm or extreme weather, the only tool you need for an aluminum awning is just a hose to clear away dirt and debris. It’s also important to cut down any limbs or large branches of nearby trees that could fall on your awning, but with just a little maintenance, your awning will protect you from the heat and elements for many years. Aluminum awnings are becoming a popular choice for residential awning projects because the aluminum has an insulated layer that will absorb heat, reducing the strain on your air conditioner. Your aluminum awning can help make the area it covers up to 20% cooler, and it can actually help to cut down on energy bills. With an aluminum awning, the sun’s brutal rays will no longer keep you trapped indoors during the summer!